Penrith was the site for Olympic Rowing, Kayaking and Whitewater Rafting. These shots were taken from near the Olympic bus entry to Penrith station. 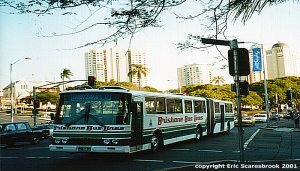 The Olympic buses left the station from the northside of the railway line (where I was), used the commuter carpark access road, turn onto Coreen Avenue and then they travel to the Sydney International Regatta Centre on Castlereagh Road. 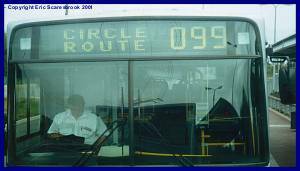 For the purposes of these captions, arriving at Penrith refers to buses coming to the station and leaving Penrith refers to leaving the station. Hawkesbury Valley Bus Service bus leaves Penrith. 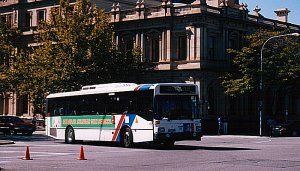 Leura-Katoomba Bus Service bus leaves Penrith. Various buses including (from front) Simocks (VIC), Busabout, Katoomba-Leura, State Transit & Jones Bros at Penrith awaiting passengers. Coachways coach on the southern side of Penrith station. Pearce bus on standby at Penrith. Jones Bros buses arrives at Penrith.